Braced frames are a very common form of construction, being economic to construct and simple to analyse. Economy comes from the inexpensive, nominally pinned connections between beams and columns. Bracing, which provides stability and resists lateral loads, may be from diagonal steel members or, from a concrete 'core'. In braced construction, beams and columns are designed under vertical load only, assuming the bracing system carries all lateral loads. Vertical bracing. Bracing in vertical planes (between lines of columns) provides load paths to transfer horizontal forces to ground level and provide lateral stability. Horizontal bracing. At each floor level, bracing in a horizontal plane, generally provided by floor plate action, provides a load path to transfer the horizontal forces (mainly from the perimeter columns, due to wind) to the planes of vertical bracing. As a minimum, three vertical planes of bracing are needed, to provide resistance in both directions in plan and to provide resistance to torsion about a vertical axis. In practice, more than three are usually provided, for example in the locations shown diagrammatically in the figure below. Assuming that the floors act as diaphragms to provide horizontal bracing, the forces carried by each plane of vertical bracing depend on its relative stiffness and location, and on the location of the centre of pressure of the horizontal forces (see further discussion on location of vertical bracing planes, below). 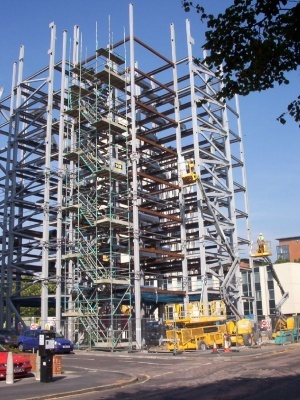 Vertical bracing, in the form of diagonal steel members, providing stability in a multi-storey building is shown in the figure below. Stability to a building can also be provided partially or entirely by one or more reinforced concrete cores. It is preferable to locate bracing at or near the extremities of the structure, in order to resist any torsional effects. See figure on the right. Where the sets of bracing are identical or similar, it is sufficient to assume that the horizontal forces (wind loads and equivalent horizontal forces, each magnified for second order effects if necessary, see discussion below) are shared equally between the bracing systems in the orthogonal direction under consideration. 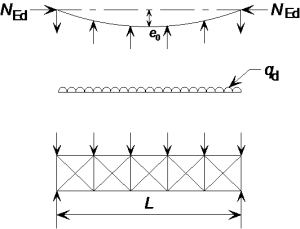 Where the stiffnesses of the vertical bracing systems differ or the bracing systems are located asymmetrically on plan, as shown in the figure below, equal sharing of forces should not be assumed. The forces carried by each bracing system can be calculated by assuming the floor is a stiff beam and the bracing systems are spring supports, as shown in the figure below. The stiffness of each bracing system should be calculated by applying horizontal forces to each bracing system and calculating the deflection. The spring stiffness (typically in mm/kN) can then be used to calculate the distribution of force to each bracing system. 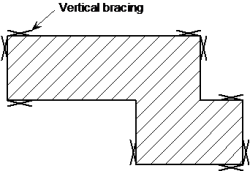 In a braced multi-storey building , the planes of vertical bracing are usually provided by diagonal bracing between two lines of columns, as shown in the figure below. Either single diagonals are provided, as shown, in which case they must be designed for either tension or compression, or crossed diagonals are provided, in which case slender bracing members carrying only tension may be provided. Note that when crossed diagonals are used and it is assumed that only the tensile diagonals provide resistance, the floor beams participate as part of the bracing system (in effect a vertical Pratt truss is created, with diagonals in tension and posts - the floor beams - in compression). Second order effects due to sway (if the frame is sensitive to second order effects). Guidance on the determination of equivalent horizontal forces and on the consideration of second order effects in discussed in the sections below, and a Frame stability design tool is also available. Forces in the individual members of the bracing system must be determined for the appropriate combinations of actions. For bracing members, design forces at ULS due to the combination where wind load is the leading action are likely to be the most onerous. Where possible, bracing members inclined at approximately 45° are recommended. This provides an efficient system with relatively modest member forces compared to other arrangements, and means that the connection details where the bracing meets the beam/column junctions are compact. Narrow bracing systems with steeply inclined internal members will increase the sway sensitivity of the structure. Wide bracing systems will result in more stable structures. The table below gives an indication of how maximum deflection varies with bracing layout, for a constant size of bracing cross section. A horizontal bracing system is needed at each floor level, to transfer horizontal forces (chiefly the forces transferred from the perimeter columns) to the planes of vertical bracing that provide resistance to horizontal forces. Usually, the floor system will be sufficient to act as a diaphragm without the need for additional steel bracing. At roof level, bracing, often known as a wind girder, may be required to carry the horizontal forces at the top of the columns, if there is no diaphragm. See figure on the right. 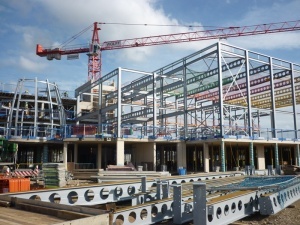 All floor solutions involving permanent formwork such as metal decking fixed by through-deck stud welding to the beams, with in-situ concrete infill, provide an excellent rigid diaphragm to carry horizontal forces to the bracing system. Floor systems involving precast concrete planks require proper consideration to ensure adequate transfer of forces if they are to act as a diaphragm. The coefficient of friction between planks and steelwork may be as low as 0.1, and even lower if the steel is painted. This will allow the slabs to move relative to each other, and to slide over the steelwork. Grouting between the slabs will only partially overcome this problem, and for large shears, a more positive tying system will be required between the slabs and from the slabs to the steelwork. Connection between slabs may be achieved by reinforcement in the topping. This may be mesh, or ties may be placed along both ends of a set of planks to ensure the whole floor acts as a single diaphragm. Typically, a 10 mm bar at half depth of the topping will be satisfactory. Enclose the slabs by a steel frame (on shelf angles, or specially provided constraint) and fill the gap with concrete. Provide ties between the topping over the planks and an in-situ topping to the steelwork (known as an 'edge strip'). Provide the steel beam with some form of shear connectors to transfer forces between the in-situ edge strip and the steelwork. 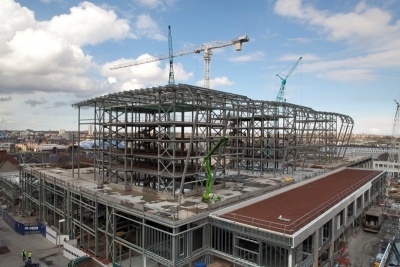 If plan diaphragm forces are transferred to the steelwork via direct bearing (typically the slab may bear on the face of a column), the capacity of the connection should be checked. The capacity is generally limited by local crushing of the plank. In every case, the gap between the plank and the steel should be made good with in-situ concrete. Timber floors and floors constructed from precast concreted inverted tee beams and infill blocks (often known as 'beam and pot' floors) are not considered to provide an adequate diaphragm without special measures. Where diaphragm action from the floor cannot be relied upon, a horizontal system of triangulated steel bracing is recommended. A horizontal bracing system may need to be provided in each orthogonal direction. Typically, horizontal bracing systems span between the 'supports', which are the locations of the vertical bracing. This arrangement often leads to a truss spanning the full width of the building, with a depth equal to the bay centres, as shown in the figure on the left. The floor bracing is frequently arranged as a Warren truss, or as a Pratt truss, or with crossed members acting only in tension. Appropriate allowances need to be incorporated in the structural analysis to cover the effects of imperfections, including geometrical imperfections such as lack of verticality, lack of straightness, lack of flatness, lack of fit and any minor eccentricities present in joints of the unloaded structure. Local imperfections for individual members. Global imperfections may be taken into account by modelling the frame out of plumb, or by a series of equivalent horizontal forces applied to a frame modelled vertically. The latter approach is recommended. In a braced frame with nominally pinned connections, no allowance is needed in the global analysis for local imperfections in members because they do not influence the global behaviour and are taken into account in when verifying member resistances in accordance with the design Standard. Should moment-resisting connections be assumed in the frame design, local imperfections may need to be allowed for (BS EN 1993-1-1, 5.3.2(6)). The effect of frame imperfections is allowed for by means of an initial sway imperfection. See figure on the right. where αh is a reduction factor for the overall height and αm is a reduction factor which according to the Eurocode depends on the number of columns in a row. (For a detailed definition, see 5.3.2(3).) This presumes that every row has bracing. More generally αm should be calculated according to the number of columns stabilized by the bracing system - generally from several rows. For simplicity, the value of Φ may conservatively be taken as 1/200, irrespective of the height and number of columns. Where, for each storey, the externally applied horizontal force exceeds 15% of the total vertical force, sway imperfections may be neglected (because they have little influence on sway deformation). Modifying the geometry of the structure can be difficult if the column bases are at different levels, as the sway imperfection varies between columns. According to 5.3.2(7) the equivalent horizontal forces have the design value of φ NEd at the top and bottom of each column, where NEd is the force in each column; the forces at each end are in opposite directions. When designing the frame, and specifically the forces on the bracing system, it is much easier to consider the net equivalent force at each floor level. Thus an equivalent horizontal force equal to Φ times the total vertical design force applied at that floor level should be applied at each floor and roof level. Forces due to imperfections at splices. In both these design situations, the bracing system is checked locally (considering the storeys above and below) for the combination of the force due to external loads together with the forces due to either of the above imperfections. The equivalent horizontal forces modelled to account for frame sway are not included in either of these combinations. Only one imperfection needs to be considered at a time. The horizontal forces to be considered are the accumulation of all the forces at the level being considered, divided amongst the bracing systems. It is normal practice in the UK to check these forces without co-existent beam shears. The justification is that the probability of maximum beam shear plus maximum imperfections together with minimum connection resistance is beyond the design probability of the design code. in which m is the number of members to be restrained. For convenience, the effects of the initial bow imperfections of the members to be restrained by a bracing system may be replaced by the equivalent stabilizing force as shown in the figure right. δq is the in-plane deflection of the bracing system due to q plus any external loads calculated from first order analysis. The use of equivalent stabilizing forces is recommended. The effects of the deformed geometry of the structure (second order effects) need to be considered if the deformations significantly increase the forces in the structure or if the deformations significantly modify structural behaviour. For elastic global analysis, second order effects are significant if αcr is less than 10. The criterion should be applied separately for each storey, for each combination of actions considered. Typically, this will include vertical and horizontal loads and EHF, as shown in the diagram. In braced frames, lateral stability is provided only by the bracing; the nominally pinned joints make no contribution to the stability of the frame. In most cases, the lowest storey will give the lowest value of αcr. Where second order effects are significant and need to be included, the most common method used is by amplification of an elastic first order analysis using the initial geometry of the structure. The use of this method is subject to the limitation that αcr > 3. If αcr is less than 3, second order analysis must be used. Only the effects due to the horizontal forces (including the equivalent horizontal forces) need to be amplified. A range of second order analysis software is available. Use of any software will give results that are to some extent approximate, depending on the solution method employed, the types of second-order effects considered and the modelling assumptions. Generally, second-order software will automatically allow for frame imperfections, so the designer will not need to calculate and apply the equivalent horizontal forces. The effects of deformed geometry (second-order effects) will be allowed for in the analysis. The following simple design process is recommended for a typical medium rise building utilizing braced frames. Choose appropriate section sizes for the beams. Choose appropriate section sizes for the columns (which may be designed initially for axial force alone, leaving some provision for nominal bending moments, to be determined at a later stage). Calculate the equivalent horizontal forces (EHF), floor by floor, and the wind loads. Calculate the total shear at the base of the bracing, by adding the total wind load to the total EHF, and sharing this appropriately amongst the bracing systems. Size the bracing members. The lowest bracing member (with the greatest design force) can be sized, based on the shear determined in Step 4. A smaller section size may be used higher up the structure (where the bracing is subject to lesser forces) or the same size may be used for all members. Evaluate the frame stability, in terms of the parameter αcr, using the combination of the EHF and wind loads as the horizontal forces on the frame, in conjunction with the vertical loads. Determine an amplifier, if required (i.e. if αcr < 10). If the frame is sensitive to second order effects, all the lateral forces must be amplified. If this is the case, the bracing members may need to be re-checked for increased forces (step 5). At each floor level, check that the connection to the diaphragm can carry 1% of the axial force in the column at that point (clearly, the most onerous design force is at the lowest supported floor). Verify that the floor diaphragms are effective in distributing all forces to the bracing systems. At splice levels, determine the total force to be resisted by the bracing locally (which will usually be the summation from several columns). Verify that the bracing local to the splice can carry these forces in addition to the forces due to external loads (EHF are not included when making this check). Verify that the bracing local to each floor can carry the restraint forces from that floor, in addition to the forces due to external loads (EHF are not included when making this check). If designing manually, the design data in SCI P363 , may be used to choose appropriate section sizes. A Frame stability tool is available to assist with the calculation of EHF and αcr. Architectural Design in Steel, Lawson M & Trebilcock P, SCI and Spon. Chapter 3. A web-based interactive version of the 'Blue Book', is also available.